When Foundry Tobacco Company unveiled the Chillin’ Moose cigar in 2014, cigar fanatics flocked from every dark corner of the map to catch a glimpse of this majestic beast in its natural habitat. But what’s more alluring than a “chillax” moose? Why, meese, of course! Er, mooses? Moose squared? In any case, Foundry has dubbed the sequel to the fan-favorite budget cigar Chillin’ Moose Too. What are the differences? To start, our “gentle giant” seems to have lost his cool—with the cigars showcasing a not-so-chill moose taking care of business and disposing of the punk rabbit that stole his stogie (a guaranteed way to ruffle the feathers of even the most chill aficionado)! 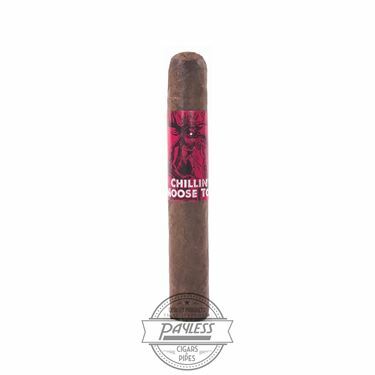 Secondly, Foundry introduces a new blend for Chillin’ Moose Too — offering cigar enthusiasts a darker, more sinister experience. Gone is the light and mellow wrapper of the original. In its place is a new, oily, Connecticut Broadleaf wrapper; which has been draped over an updated interior of 100% Nicaraguan tobacco! This makes for a more rich experience, showing spicy/sweet flavors of cocoa powder, black pepper, vanilla bean, and fresh-cut cedar wood. Chillin’ Moose Too is medium-bodied and easily enjoyed at any time of day. Best of all, the price range remains in line with its predecessor — offering cigar fanatics one of the best bang-for-your-buck smokes you’ll ever lay eyes (or taste buds) on!